Having Fun... A Prerequisite for Learning? There is no doubt in my mind that learning should be fun*. I get this overwhelming sense of excitement and a general giddiness when I'm learning something new. Now, since school is a place of learning, it should be one of the most fun places on the planet, right? Think about your own school. Is it a fun place to be? This is just a thought that has been rattling around in my head but: is fun a pre-requisite for learning? 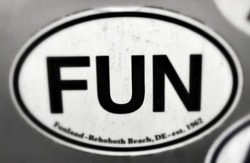 Fun is a simple word and might be easily misconstrued. I think for me it is synonymous with exciting, joyful, satisfaction and delight. Perhaps most of all, I equate fun with happiness. I'm worried that school is no longer a fun place to be, or at least it's not as fun as it could be (for both teachers and students). I read recently in the MetLife Survey of the American Teacher that only 44 percent of teachers surveyed reported being very satisfied with their jobs, compared with 59 percent in 2009. If teachers are not satisfied with their jobs, it must be harder to create a fun environment, right? But, does learning need to be fun to be effective? I really think so. Naturally, there is more to creating a meaningful learning environment than simply making it fun, but I contend that it is a critical ingredient. I haven't done any research on this but looking back at my own experiences as a student the school activities I actually remember were all fun: Mrs. Okada's real-world economic activities, Mr. O'Leary's crazy physics experiment, and Mr. Snow's lively class simulations (and even more lively class discussions). I also remember that all of us were having fun... students AND teachers. Without a doubt I believe that fun learning activities are more memorable. Think back to your best learning experiences, did they contain an element of fun? I bet many of them did. So, what makes for a fun classroom environment? I brainstormed a few things. Let go of control - Nobody likes a control freak. Involve your students in decisions, let them be in charge sometimes. Create a risk taking environment - Worrying about failure is stressful (i.e no fun). Make sure students know that it's ok to make mistakes... as long as they learn from them. Use technology - Technology can unleash creativity... being creative is fun. Be a learner yourself - It provides great perspective and can be invigorating and motivating. With the Internet you can learn just about anything, take advantage of it. Reflect a lot - How can you improve if you don't? Assess differently - You don't always have to give the kids a quiz or a test to see if they know something. Create some project-based learning activities - Hands-on, minds-on is fun. Let the kids build & destroy... and everything in between. Make it relevant - Learning something without knowing why it is important is not fun. Be Creative - Ample opportunities to be creative is fun for students and for you. Create activities that allow students to be creative. Worksheets, by their very nature, are generally not fun. Always remember that the standards inform what we need to teach but don't dictate your instructional design. Be Empathetic - Put yourself in the shoes of your students... think "if I was a student in my classroom would this be fun?" Alternatively, "would I want to be a student in my class?" Laugh a lot - Fun and laughter go together. Your classroom should be filled with laughter... yours and theirs. Well, that's all I've got. What do you think? * I don't mean to imply that learning is not serious business. The stakes are very high but I think it is possible to maintain the importance of what we do and still have fun. The fun I experience when learning is different that the fun I have at a party or a roller coaster... but it is no less meaningful... or important. April 22, 2012 by Brett Sparrgrove.